The Young And The Restless Spoilers: How Far Will Kyle Go To Take Over Jabot? 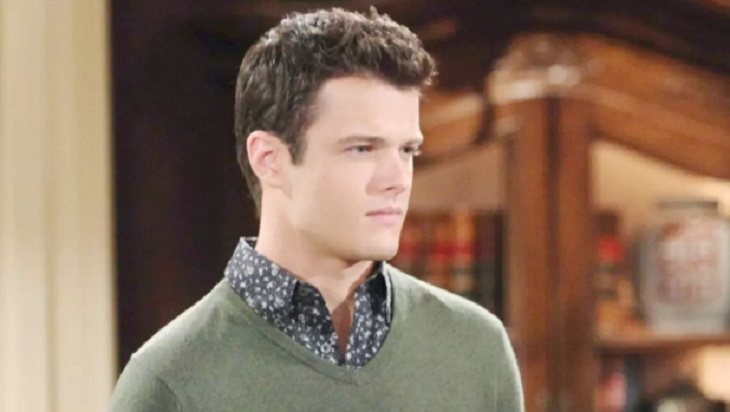 The Young and the Restless rumors indicate that Kyle (Michael Mealor) will amp up his plan to become head of Jabot, even if it means doublecrossing his aunt Ashley (Eileen Davidson). The battle for Jabot is one of the biggest storylines currently on Y&R. Thanks to a clause that only blood Abbott can be head of the company, Ashley and Jack (Peter Bergman) can’t hold the position since John Abbott (Jerry Douglas) isn’t their biological father. After the revelation came that Jack wasn’t a true Abbott, Billy (Jason Thompson) took over as CEO. However, Billy’s reign as CEO has been met with drama. The latest has to do with his plan to open his own line of Jabot boutiques, which could lead to the end of Lauren’s (Tracey Bregman) own business Fenmore. With Ashley not agreeing with Billy’s choices, they’ve begun plotting to get him ousted as CEO. Kyle wanting to move up the ranks in Jabot has decided to join in on the plot. The plan is for Ashley to reverse the blood clause and step in as CEO, yet that may not happen if Kyle has anything to do with it. Kyle has shown he’s willing to do whatever it takes to get ahead in life. Upon learning of Summer’s (Hunter King) plot to seduce Billy, Kyle has decided to use this as his advantage. Not only will he win his bet, but he’ll also create enough turmoil to get Billy ousted from Jabot. Yet, that may not be the end of Kyle’s devious ways. When it comes time to appoint a new CEO for Jabot, Ashley’s going to be in for a shock when her nephew decides he wants the position. Knowing how bad Kyle wants the job, there’s no telling what tricks he’ll use to secure his future at Jabot, even if it’ll cost him his family. Kyle’s double cross will not only add more drama to Jabot and The Abbotts, but it could be the thing that forces Ashley to leave Genoa City. Carol’s love of soap operas began when she was a kid when she watched an episode of The Bold and the Beautiful with her mom. Since then Carol’s love of soap opera began and she became a lifelong fan. These days her main soaps are B&B and Y&R. When she’s not writing about the soaps, she’s busy working on her next romance novel and playing with her fur babies. General Hospital Spoilers: Lulu And Maxie Need Love – Frienemies Feud Over Chase?